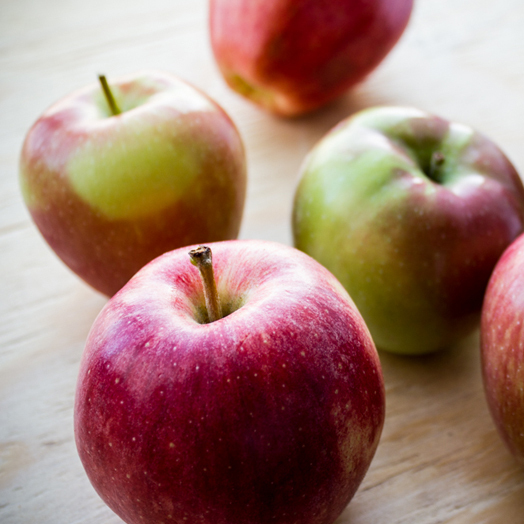 McIntosh: This popular variety has a thick red and green skin with soft white flesh. Commonly grown in New England, it is as good a snack as it is a variety for preparing apple sauce or apple cider. The Mcintosh apple grows through fall and into early winter. As the season progresses, their taste becomes increasingly sweeter. Empire: Empire apples are actually a cross between the Mcintosh and Red Delicious apples. The skin of the empire apple is thin and bright red with faint white striations, its top is capped with a light green blush. It is a medium sized apple and round in shape with a creamy white interior. Its crisp and juicy flesh has a flavor that is sweet like a Red Delicious and tart like a McIntosh. For more information on apple varieties visit this resource. Refrigerated apples last much longer than those left at room temperature. Apples emit ethylene, a naturally occurring gas that speeds ripening. To prevent apples from speeding up the ripening process of other items in your produce drawer, store them in a plastic bag. Conversely, if you want to speed up the ripening of bananas (or any other ethylene sensitive produce) you can place an apple in a bag with the bananas. To maximize an apple's flavor, let it come to room temperature before eating it. We have access to organic apples year-round, usually from Washington state. We typically receive local Vermont apples during the fall and continue to receive them from storage through the spring.